We ask you to recognize that your investment in our company may not be as profitable to you as it has been historically. At the same time, we ask you to recognize that our scientific efforts serve a fundamental public good, the improvement of human health. We seek to maintain our talented and dedicated workforce because we feel that this human capital is the best way for us to achieve our underlying goal: to provide safe, innovative and life-saving medicines for people that need them. This can only be achieved through a more thorough understanding of what this industry strives to accomplish and we ask you, as investors, to consider what you intend to accomplish through your investment in our company. I know, I’m a naive schmuck. Inspired by a DrugMonkey post, here is some useful data on NIH funding for those in Southern Arizona. UA is technically not in Gifford’s district so most of this is to private companies, but we all know those companies locate here due to interactions with UA (or are spinoffs from UA). Almost all of that is to UA. Not small potatoes! A 3% cut on that means a $5,611,743 hit to the Tucson economy. That number is slightly exaggerated due research expenditures that leave here but assuming a (very reasonable) 75% salary outlay per grant its still $4,298,807. States and the federal government might issue bonds to support innovation in biomedical science and health services, with preference given to high-risk research and diseases important to public health. Such bonds have long been used to support athletic facilities, airports, and roads. They provide a mechanism for private investment to meet public needs. Surely everyone has seen the news of the new proposal to return NIH budgets to 2008 levels. Calls for those of us in the public sector research enterprise to call or write our Congress Critters are coming from all of our professional organizations right now. If you’re going to call or write your rep, it might be worthwhile to have some numbers in hand to remind that staffer of the impact of NIH research. We all talk about impact on health outcomes, etc., and maybe some of us talk about economic impact of NIH investment but the role of NIH research in private sector development has been harder to pin down (and some of the previous adversarial industry vs. academia spats have not helped). A major argument I have heard from Republicans is that while NIH research is nice and all, the main driver for health care innovation is the private sector. The primary innovation area is widely viewed as pharmaceutical development. This brand spanking new NEJM paper throughs a serious wrench into that argument. 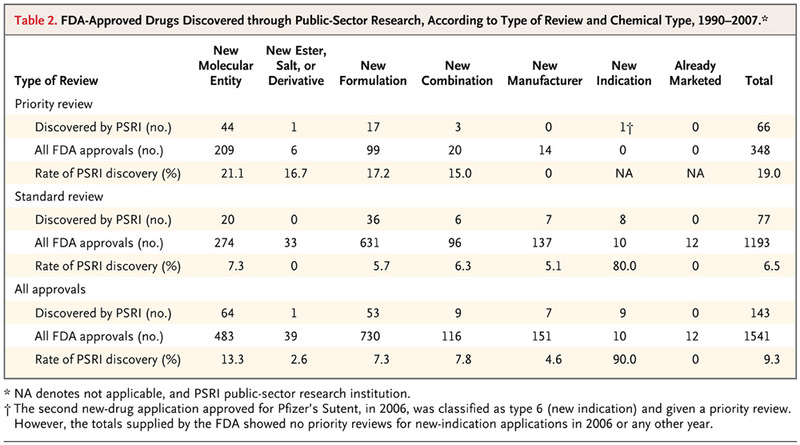 My favorite part of this, and the argument I am going to use, is that new indications for existing drugs is coming almost entirely from public sector research. There are serious cost savings opportunities to be found going this route and FDA approvals for new indications is just the tip of the iceberg. Unfortunately for me, my rep, who is almost always responsive to these things, is not able to do the job she has done so terrifically for the past several years right now. I have a feeling, though, that her friends, family and staff can be counted on for strong NIH funding support so I’m gonna ring up the local office. This disgusts me beyond my previous comprehension.